1) On-field competition in the respective sports. They will be organized and seeded in the usual ways and will proceed through as many rounds as necessary to determine the national champion. 2) In-studio competition among all of the teams that have qualified for the on-field competition. The in-studio competition will be in the format of the “College Bowl” television shows. Initial matchups will be identical to those in the on-field competition. The teams will proceed through as many rounds as necessary to determine the national champion. 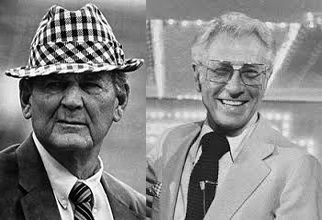 Paul Bryant and Allen Ludden, giants of the gridiron and television studio, respectively. The Bryant-Ludden Trophy, emblem of student-athlete superiority, will be named in their honor. All competitions will be televised and broadcast over as many media outlets as possible so as to maximize available revenues. All funds and rights fees from the tournaments, including revenue from the sale of souvenirs, t-shirts, software packages, etc. will be pooled. Each time a team in either field wins a match, it will gain a “victory point.” The more victory points an institution receives, the higher its share of the winnings. After all competitions are complete, and the champions in both sectors determined, the money will be distributed to the schools and to the competing athletes. Fifty percent of each institution’s winnings will go to the school to use as it sees fit. The other fifty percent will be paid directly to the student-athletes. The members of the in-studio teams must be selected from the playing rosters of the on-field teams. They must be letter-winners in their respective sports, not nonparticipating bench-warmers. The team captain of the on-field team must be one of the members of the studio team. However, it is not mandated that he or she also be designated as captain of the studio team. The team that scores the most victory points in a given academic year, and therefore wins the most money, will receive the coveted Bryant-Ludden Trophy, the new emblem of the highest level of student-athlete achievement in America. Now let’s let the games begin! Logan Mankins, late of the New England Patriots, will hereafter be cashing his generous paychecks in Florida, just his second professional sporting home. As you ponder that news, consider how far we’ve come since the days of America’s first documented professional athlete, the peripatetic Lipman Emanuel “Lip” Pike. Lip Pike was the first American to be revealed as a professional athlete. He was also the first Jewish baseball player. And he was a good one. Known as the “Iron Batter,” he first appeared in a box score one week after his bar mitzvah in 1864. He joined the Philadelphia Athletics in 1866, and he was paid $20 a week under the table. Two other guys were also reportedly getting money from the A’s, and a hullabaloo ensued. The National Association of Base Ball Players set up a hearing on the matter, but nobody showed up and the whole thing was dropped. By 1869, however, the façade of amateurism in baseball had fallen away, and the Cincinnati Red Stockings became the first openly professional baseball team. So Lip Pike was a Jackie Robinson of sorts – he broke a barrier and paved the way for others. What he did was first deemed unacceptable. Society eventually got around to embracing it, but I bet nobody every thanked Lip Pike. Pike also endured prejudice, but of a different sort than that felt by Robinson or by Pike’s Jewish brethren. Yes, Lip was a powerful hitter and speedy runner – he once hit six homers in a game that the Athletics won 67-25. 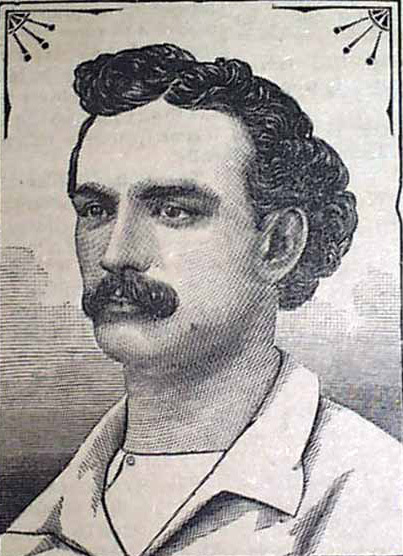 But the A’s dropped him from the team in 1867. Why? Because he was a “foreigner,” as far as the team’s fans were concerned. He was from New York. They couldn’t have that, in the City of Brotherly Love. Pike wasn’t finished. He had a lengthy career, playing for teams like the New York Mutuals, Brooklyn Atlantics, Troy Haymakers, Providence Grays, Baltimore Canaries, Hartford Dark Blues, St. Louis Brown Stockings, Worcester Ruby Legs, and New York Metropolitans. He was always on the move. Harry “Suitcase” Simpson had nothing on Lip Pike. 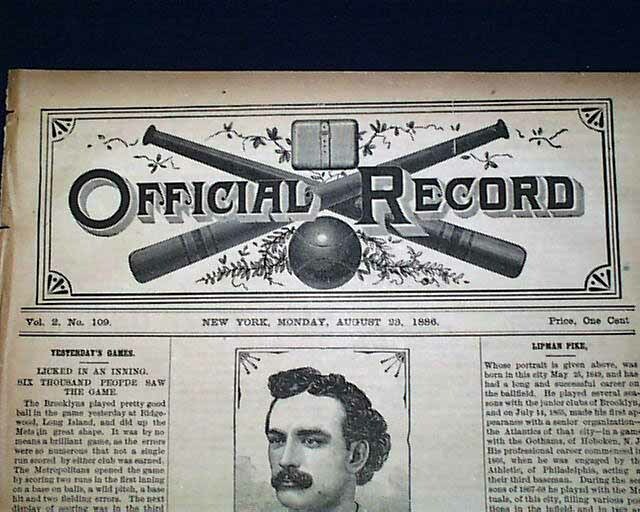 August, 1886 Media Coverage of Lip Pike and His Baseball Exploits. Newspaper Price: One Cent. In 1869 Pike batted .610 for the Atlantics. He was their second baseman in 1870 when they beat Cincinnati and ended the Red Stockings’ 93-game winning streak. Pike also used his speed and skill to make money in other ways. On August 16, 1873, he raced a trotting horse named Clarence in a 100-yard sprint at Newington Park in Baltimore. Lip won by four yards with a time of 10 seconds flat, earning a nice little prize of $250. Of course, Lip Pike is enshrined in the International Jewish Sports Hall of Fame. In 1936, according to Wikipedia, he got one vote for election to the Baseball Hall of Fame in Cooperstown. As far as I’m concerned, Lip Pike belongs in Cooperstown too. 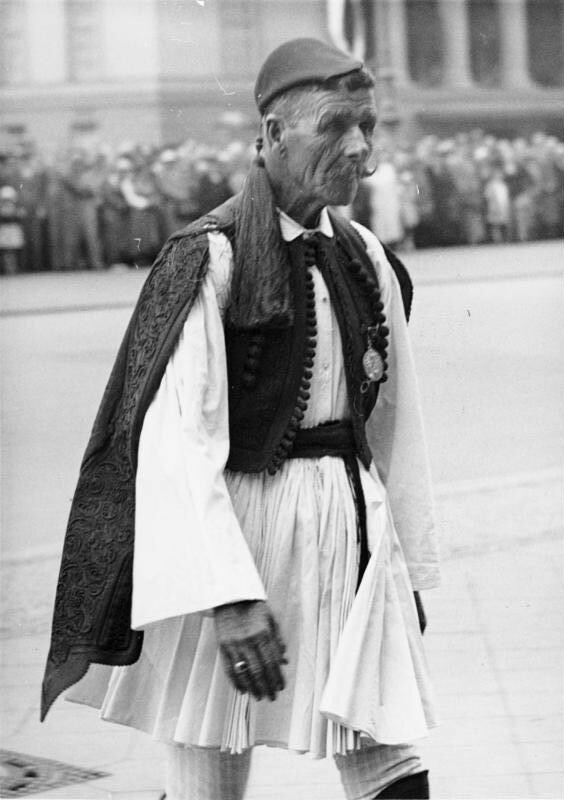 Spiridon Louis, the Greek shepherd boy who won the marathon race at the 1896 Athens Olympics. Full disclosure: I still get goosebumps when I read the old stories of Spiridon Louis (1896 marathon winner, shown here at the Berlin games), Jim Thorpe, Ray Ewry, Johnny Weissmuller, and all the rest. I cherish the photos that I have of my grandfather officiating in Los Angeles in 1932, and posing aboard the S.S. Manhattan in 1936 with Johnny Kelley the Elder and Jesse Owens. I loved the idealism of Baron de Coubertin and I think the Olympic ideal is cool. 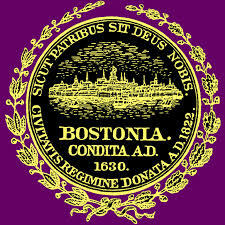 A part of me would love to see Boston as host city for the 2024 Summer Games, as some of our civic leaders have proposed. But only a part of me. I know that the Olympic Ideal is all fluff and chiffon for those who organize, televise, and perform in the games.. “The name of the game is bucks,” as my radio professor Dan Viamonte kept reminding us. My city, or any city, should not have to mortgage its future and put up those bucks to build a gigantic new athletic stadium. My city should not have to erect tens of thousands of new, luxury housing units that will be used for two weeks and then abandoned. No bucks from us for the privilege of hosting the Games. Rather, we think it will be a privilege for athletes from around the world to compete for their countries here, in the Cradle of Liberty. So, International Olympic Committee, here’s what we’ll do. You can have your games in and around Boston. They will take place in August. We will arrange for our august (small “a”) institutions of higher learning to delay their openings for a few weeks. We’ll have them all pitch in and host the athletes from one or more countries. The Japanese can stay at Showa Institute. The Israelis can live at Brandeis. The Irish will be housed at Boston College. Athletes from Communist countries can stay anywhere they want in Cambridge. And so on. Each national team can pay market rent for its housing arrangements. There’s plenty to be found, but no freebies. If you play, you pay. We’ve got all the venues. We’ll have swimming at Harvard, sailing at Marblehead, equestrian at Myopia, all the other events at existing stadia and arenas. Of course, the marathon will be from Hopkinton to Boston, the setting for the world’s premier road race. 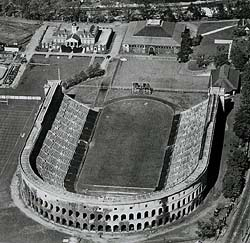 The opening and closing ceremonies will be at Harvard Stadium. What better atmosphere for them than America’s version of the Roman Coliseum? TV money foots all the bills. Not a penny from taxpayers. We’ll work as volunteers during the games, and we’ll put up with the traffic and inconvenience. We’ll be glad to have you. But you’ve got to show us that you appreciate our hospitality. That’s tradition. That’s a Boston Olympic ideal. Keep that in mind and let the games begin. You are currently browsing the Veteranscribe's Blog blog archives for August, 2014.